There is a lot of interest in crochet patterns for horses and ponies, so I gathered the best that I could find for this collection. A crocheted pony was one of the first toys that I ever made from yarn for my daughter. She now has five horses of her own, but she still treasures her herd of crocheted ponies. Smile. Vary the weight of the yarn (and hook) to crochet this adorable equine in one of three sizes. Modern and vintage photos are shown, as well as the complete pattern instructions. Crochet a horse small enough to fit in the palm of your hand. Girls of all ages will love to stash their treasures in this horse purse. 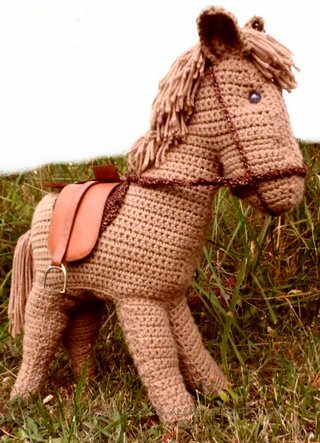 Free download crochet horse pattern from Ravelry by Sonea Delvon Designs. Horse motif purse worked in tapestry crochet where more than one color of yarn is worked at the same time. One of a collection of barnyard patterns. Crochet a mini horse (3-1/2″ x 4″), complete with saddle and bridle. Inspired by the My Little Pony collection. Horse head silhouette in filet crochet. Free crocheted pony pattern, by April Folts, with felt mane and tail. Free PDF download from Dawn Toussaint.